Why is a Strong Digital Presence Important for my Small Business? Did you know your online presence could make or break your business? Especially for small businesses. While small businesses don’t have as many resources or as much time to spend on their online presence it is extremely important. Building your authority online is quite simple. What does a good online presence include? Let’s face it when we’re looking for a barber shop, plumber, restaurant, bakery; we turn to Google, Facebook, and Instagram to check out what the company is about. For many people, this is their first impression of your business. It is important to highlight your products and services in order to show customers what your business is about. While you can control what you have on your website and on your social media accounts, you CANT control what customers or news say about your business. A company blog can also help get your values and mission across to consumers. Blogs allow the company to implement their own style and personality in front of their audience. If you’re not staying up to date with your companies digital presence you could be giving your competition more business. As a small business owner, you want to show your customers why they should choose your brand not give them a reason to buy another brand. In our modern world, businesses must ensure that they are not left in the dust by the competition. Having an online presence is one of the most important investments that a business can make. The more time you spend dedicated to building your online presence the more you will get out of it. The benefits that your digital presence could have on your small business are endless! If your business’s website is not up to date or you want a new look, contact Nextfly Web Design for your needs. 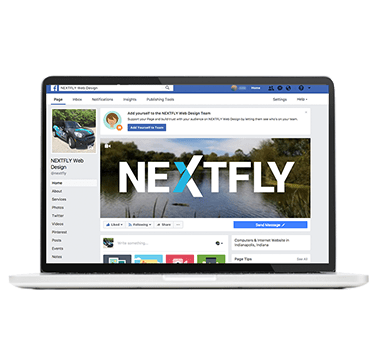 Nextfly also offers other services to benefit your business’s social presence. such as digital marketing and social media retainers.